Start off your visit on the 15th (Tue): steep yourself in history at Mehrangarh Fort. To see photos, more things to do, traveler tips, and more tourist information, go to the Jodhpur trip planner. Mumbai to Jodhpur is an approximately 2-hour flight. You can also drive; or take a train. 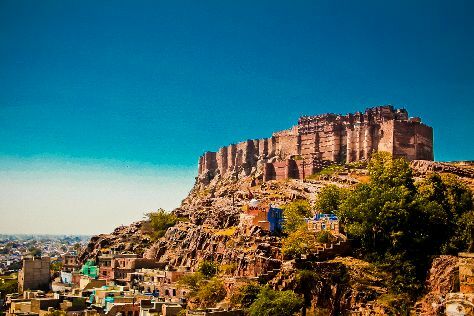 When traveling from Mumbai in May, plan for somewhat warmer days in Jodhpur, with highs around 48°C, while nights are about the same with lows around 32°C. Wrap up your sightseeing on the 15th (Tue) early enough to travel to New Delhi. Start off your visit on the 16th (Wed): contemplate the long history of Humayun's Tomb, take in nature's colorful creations at Swaminarayan Akshardham, and then contemplate the long history of India Gate. On your second day here, admire the striking features of Rashtrapati Bhavan and then take in panoramic vistas at Qutub Minar. 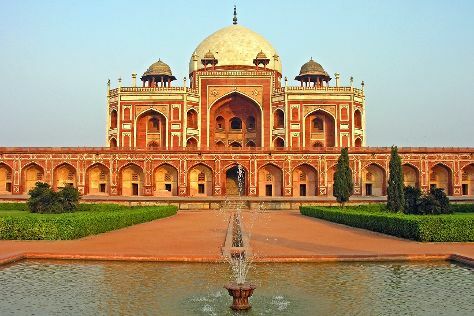 To see ratings, where to stay, more things to do, and other tourist information, you can read our New Delhi sightseeing planning site . Fly from Jodhpur to New Delhi in 3 hours. Alternatively, you can drive; or take a train. In May in New Delhi, expect temperatures between 47°C during the day and 30°C at night. On the 17th (Thu), wrap the sightseeing up by early afternoon so you can drive to Agra. Start off your visit on the 18th (Fri): explore the historical opulence of Agra Fort, then admire the landmark architecture of Diwan-i-Am Agra Fort, and then admire the landmark architecture of Taj Mahal. To find reviews, photos, where to stay, and other tourist information, use the Agra trip itinerary planner . You can drive from New Delhi to Agra in 3 hours. Other options are to take a train; or take a bus. In May in Agra, expect temperatures between 48°C during the day and 30°C at night. Cap off your sightseeing on the 19th (Sat) early enough to go by car to Jaipur. On the 19th (Sat), step into the grandiose world of Amber Fort and then look for gifts at MoonlightGems. Get ready for a full day of sightseeing on the 20th (Sun): see the sky in a new way at Jantar Mantar - Jaipur, take an in-depth tour of City Palace of Jaipur, then admire the striking features of Hawa Mahal - Palace of Wind, and finally make a trip to Jagat Shiromani Ji Temple. For photos, more things to do, reviews, and other tourist information, you can read our Jaipur tour itinerary maker website . You can drive from Agra to Jaipur in 3.5 hours. Other options are to take a train; or take a bus. In May, plan for daily highs up to 48°C, and evening lows to 32°C. Finish your sightseeing early on the 20th (Sun) so you can travel to Udaipur. Kick off your visit on the 21st (Mon): contemplate the waterfront views at Lake Pichola and then take an in-depth tour of City Palace of Udaipur. For other places to visit, photos, more things to do, and more tourist information, use the Udaipur trip planner . Traveling by flight from Jaipur to Udaipur takes 1.5 hours. Alternatively, you can drive; or take a bus. In May, plan for daily highs up to 47°C, and evening lows to 31°C. Finish your sightseeing early on the 21st (Mon) to allow enough time to travel to Mumbai. Mumbai is known for historic sites, scenic drive, shopping, theme parks, and beaches. Your plan includes some of its best attractions: don't miss a visit to Gateway of India, take an in-depth tour of Mani Bhavan Gandhi Museum, take a memorable drive along Marine Drive, and snap pictures at Bandra-Worli Sea Link. For maps, photos, reviews, and more tourist information, read our Mumbai trip itinerary planner . Fly from Udaipur to Mumbai in 2 hours. Alternatively, you can drive; or take a train. While traveling from Udaipur, expect little chillier days and about the same nights in Mumbai, ranging from highs of 39°C to lows of 31°C. Wrap up your sightseeing on the 24th (Thu) to allow time to travel back home.